The epic Game of Thrones online slot machine, based on the popular American fantasy tv series, has finally been released! This is one not to be missed! 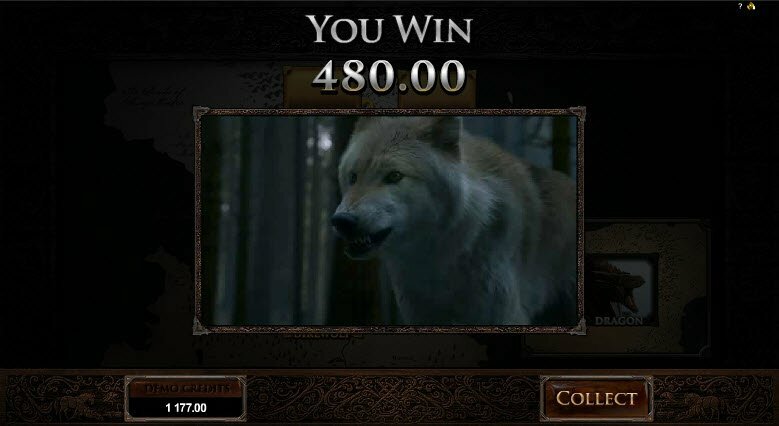 Many fans will be thrilled to know that the long awaited Game of Thrones online slot, based on the popular hit TV series, has finally been released. Fans can now play this particularly excellent slot at some of their favorite online casinos. In addition to this, players will be happy to know that they can also enjoy the Game of Thrones mobile slot version. Throughout the Game of Thrones series, one will see an epic struggle for the Iron Throne. Viewers are carried away into a distant land of kings and queens, as well as lords and knights, who all play their part in this battle. Microgaming has done it yet again. Players can finally visit the fictional continent of Westeros, well known to loyal fans of the series and books. Play the winning 5x3 reel Game of Thrones slot machine and choose to play with 243 ways to win or with 15 paylines. 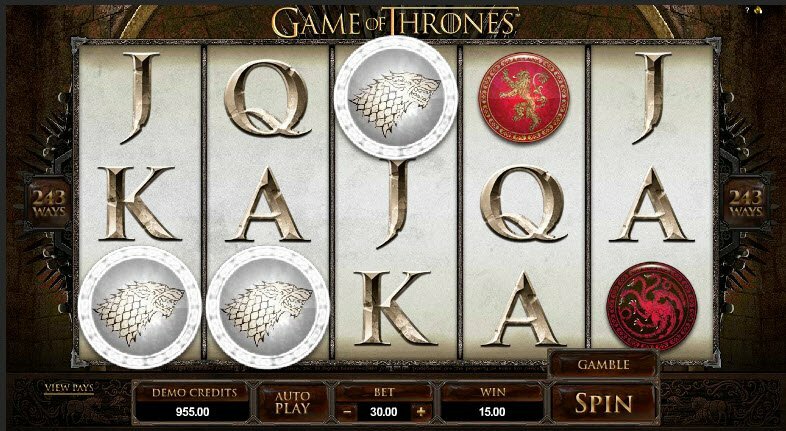 The Game Of Thrones slot machine offers great bonuses, gameplay and is based on one of the all time biggest TV shows. Random prizes keep players on the edge of their seat. Simply land two iron throne scatter symbols in any random spot on the reels and a blazing dragon’s egg will appear on the screen offering sizzling rewards. Players can also expect tons of fun with stacked wilds, which can be found in the base game and the free spins bonus game. Simply land three, four or five scatter symbols and enter the free spins bonus game. At this point players can select which one of the main houses they wish to pledge their allegiance to. Join the noble families and battle it out for control over the land of Westeros. The houses are as follows: Baratheon House, Lannister house, Stark house and Targaryen house. 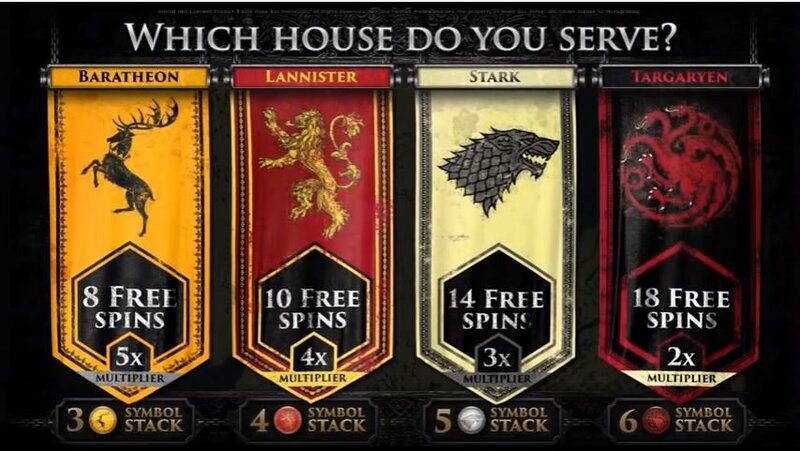 Each house is based on a specific amount of spins and multipliers. Select the one with more free spins and lower multipliers, or less free spins and higher multipliers. Select your winning house and claim your right to the throne. - Baratheon house: 8 free spins, 5x multiplier and 3 stacked Baratheon symbols. - Lannister house: 10 free spins, 4x multiplier and 4 stacked Lannister symbols. - Stark House: 14 free spins, 3x multiplier and 5 stacked Stark symbols. At the end of any winning round, players can try their luck and gamble further as they play the Game of Thrones video slot. Select the gamble option by choosing heads or tails on the Braaivosi coin. If the coin flips and lands in your favor, then you double your winnings as you travel along an exciting trail into 4 hidden locations. The Game of Thrones casino game graphics are impressive to say the least. All images are consistent with those that fans have come to know very well. In addition to this, the highly popular Game of Thrones soundtrack can be heard whilst playing, thus creating a consistent theme throughout this epic slot. As you can realize from reading this Game of Thrones slot machine review, GOT is an excellent game for fans of the world and characters, as well as those who are simply looking to play another dynamic slot powered by Microgaming. I’m a huge fan of branded slots and Microgaming did a great job of capturing the feel and the mood of the HBO show. The fee spins bonus game is a nice touch, too. Very intresting combos and options to gamble, I do sometimes get carried away with the stakes but overall agree with your review it’s a very nice game that deserves getting a – 90. I love the Game of Thrones HBO series and I was pleased to see that this slot is actually pretty good for being based off a series. I’ve played other games based on movies, games, and comics, etc. and haven’t been nearly as impressed. The free bonus rounds are good and I’m a fan of the cinematic sequences. one of the few games that stand out after a few years.